Beignet (English: /bɛnˈjeɪ/; French: [bɛɲɛ], ben-YAY literally bump), synonymous with the English "fritter", is the French term for a pastry made from deep-fried choux pastry. Beignets may also be made from other types of dough, including yeast dough. 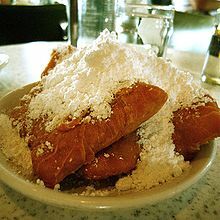 The tradition of beignets dates to the time of Ancient Rome, although the practice of frying food itself extends much further back; references to the ancient Greeks frying various foods in olive oils during the 5th century BC exist, and other cultures have adapted their own methods as well. The term beignet can be applied to two varieties, depending on the type of pastry. The French-style beignet in the United States, has the specific meaning of deep-fried choux pastry. Beignets can also be made with yeast pastry, which might be called boules de Berlin in French, referring to Berliner doughnuts which have a spherical shape (in other words, they do not have the typical doughnut hole) filled with fruit or jam. In Corsica, beignets made with chestnut flour (Beignets de farine de châtaigne) are known as fritelli. Donuts (doughnuts) in Quebec and elsewhere in Canada are referred to as both Beigne and Beignet in French. Beignets are commonly known in New Orleans as a breakfast served with powdered sugar on top. They are traditionally prepared right before consumption to be eaten fresh and hot. Variations of fried dough can be found across cuisines internationally; however, the origin of the term beignet is specifically French. In the United States, beignets have been popular within New Orleans Creole cuisine and are customarily served as a dessert or in some sweet variation. They were brought to New Orleans in the 18th century by French colonists, from "the old mother country", also brought by Acadians, and became a large part of home-style Creole cooking, variations often including banana or plantain – popular fruits in the port city. Today, Café du Monde is a popular New Orleans food destination specializing in beignets with powdered sugar, coffee with chicory, and café au lait. Beignets were declared the official state doughnut of Louisiana in 1986. 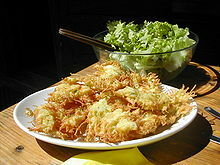 ^ "beignet". Collins English Dictionary – Complete and Unabridged. HarperCollins Publishers. 2003. ^ a b c Davidson, Alan (1999). Oxford Companion to Food. Oxford University Press. p. 70. ISBN 9780192115799. ^ Randal, Oulton, (5 October 2010). "Deep-Fried Foods". CooksInfo.com. Archived from the original on 20 May 2015. ^ a b "Beignet History and Recipe". WhatsCookingAmerica.net. Archived from the original on November 9, 2016. Retrieved February 13, 2017. ^ Schneider, Wendi (1989). The Picayune's Creole Cook Book. New York: Random House. p. 385. ^ "Beignets". cafedumonde.com. Café du Monde. Archived from the original on August 24, 2018. ^ "Of Interest to Women: Banana Served In Appetizing Forms". The Philadelphia Inquirer. January 1, 1907. ^ "History". cafedumonde.com. Café du Monde. Archived from the original on 2011-11-03. ^ "Beignet: Louisiana State Doughnut". statesymbolsusa.org. Archived from the original on April 1, 2015. Retrieved February 13, 2017. Wikimedia Commons has media related to Beignets.